This post appeared at the Internet Café today, but I wanted to share it here with you as well. And suddenly the tears were flowing. My heart went from one desperate need to another. As the requests flowed and my heart and mind aligned in prayer, I felt like each prayer was a little bubble floating upwards. Released from my heart and directed towards God. But that’s not what made the tears flow. I could imagine God on the receiving end of these prayer bubbles, watching each one rise towards Him and then gently cradling it in His hands before tucking it away. He treat4ed each one with tender care, like rare and special and fragile artifacts. They are. Sometimes I think I’m too careless with my prayers. It’s like I’m pitching a baseball in God’s general direction. Plenty of energy and speed but no time to aim. Many of them go wild. And then, there are times when I realize how important these prayers are. When I recognize them as God’s love in my heart, giving me supernatural affection for the people He has placed in my life. When the prayers I pray come from my heart, which comes from God’s heart, and go back to God’s heart, there’s something special that happens. The prayers change me. The love overflows and rubs off onto my own life. Because God told us to love as He loves. To put others before ourselves. To pray in accordance with God’s will. To believe that God loves His children so much that Jesus came to redeem us. So as I send up these beautiful, shimmering bubbles of prayer, I am in are of the God who cares that much. The One who waits to hold those needs close to His heart and cradles them with His gentle love and attention, treating each of them as a fragile and precious thing. Allowing us to have a part in this, by using prayer to generate these objects of true beauty. Dear Precious Lord, thank You for letting us be part of this beautiful act of creation. Receive our needs with gentleness and mercy, and help us to entrust You with them. Also, Lord, help us to always remember just what a beautiful gift prayer can be. In Jesus’ name I pray, amen. I’d love to pray for you today. Leave a message in the comments and I’ll start releasing some beautiful, shimmering bubbles of prayer on your behalf. God is waiting, and He is listening. Thanks for your timely inspiration. I’ll be off to Dollar Tree tomorrow for some bubbles and wands. Luke 18:17, John 1:12 and Romans 8:14 are the theme verses for the second day of a women’s retreat that I am leading. We will be coloring, singing choruses and zipping down the 1360 ft. zipline at our church camp. I am adding blowing bubbles to illustrate intercessory prayer. Later we will have a nap time, snack time and at our evening bonfire, s’mores, to reinforce the message that God is pleased with a childlike faith. The message for lifelong and very new Christians, alike, that God is as delighted with our first steps along the Way as we are with the first steps of our children. That where we are right now in our spiritual walk is an excellent place to begin or to begin again. More than a year ago you sent me a Beautiful Word Bible and a copy of Praying Upside Down. That Bible has been a true blessing in the life of a young girl and the book has been passed around to women in my small group. Thanks for all that you write and all that you do in His name. 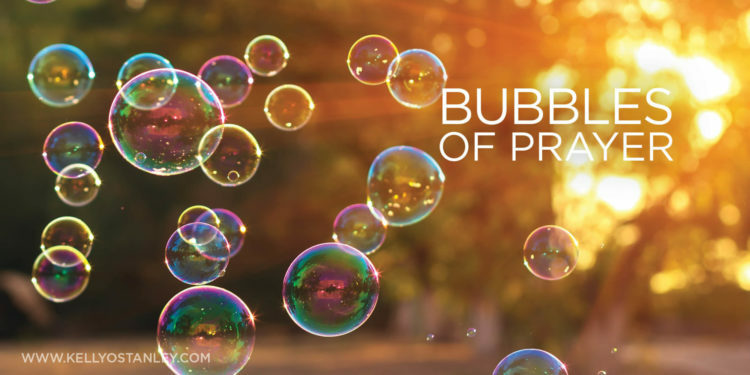 I love the idea of using bubbles to illustrate intercessory prayer! Because when we send them up, God gets them. Even if they appear to burst along the way! Love your theme ideas. And thanks for letting me know how those gifts have been put to use — that makes me happy. Thank you for your encouragement! Kelly thank you for another precious offering. I have felt that exquisite aching joy you so beautifully describe, and I appreciate the metaphor of bubbles. I hadn’t thought of it that way before, but the visual thought will be so helpful as I pray for my people. Thank you, as well, for offering to pray for me. I find myself in the position of needing to work, appreciating the privilege of honest labor, but my job causes me a lot of physical pain and it is getting more and more difficult as I age. I would so appreciate direction from God, His provision of either healing or a different job which won’t hurt my health. The trouble is that I have never done anything else, and I don’t know how to do anything else. That doesn’t stop our God, but I feel I am clueless and trapped in a way. You are so kind, so precious to pray for me. Even one bubble of prayer from you would be such a blessing. Thank you so very much. Thank YOU, Susan! Dear Lord, thank You for this woman and her faith. Thank You for the ways she has encouraged me. Relieve her from this pain and put her in a place where You can continue to use her for your glory without such strain on her body. Lord, You are good. You are able. We trust You, and we wait with confident expectation to see the way You will answer! Amen!